I think everyone should create a Google Plus page to grow their blog or business. Many people, however, wind up using their personal Google plus profiles to market their blog. This is not an ideal situation. It’s a much better idea to create a dedicated Google Plus page for your blog, business or website. There are many Google Plus Benefits for business that helps you network and grow your audience. Why should you create a Google Plus page? Though Google+ has had a rocky history, there are many reasons why you should embrace it with open arms. Google plus may have its weaknesses (such as a confusing UX), but there are many benefits to using Google Plus and creating a Google Plus page for your blog. Great for SEO: From an SEO perspective, Google Plus is great. Posting on Google+ helps index your content more quickly on Google; it helps get your content out into the world (for backlinks); it adds trust, and it is good for Local SEO. Also, the more plus 1’s you get, the more you will show up in search results for those people! Less competitive: Trying to dominate your niche on Facebook or Twitter, but with lackluster results? It could be because these platforms are flooded with marketers in your niche. Why not try your luck out with Google Plus? The competition on Google Plus is much lower than on larger social media networks like Facebook. Since Facebook is the hundred pound gorilla, everybody focuses on Facebook and the other large social media websites. You will likely have much less competition becoming a thought leader on Google plus. One of the top 4 social media networks: Though Google+ didn’t create a ripple in the social media world as Google had hoped for; Google Plus is still a major contender. Google plus is the 4th largest social media network. Buffer Support: I’m a big fan of Buffer, the social media automation tool. Buffer allows you to schedule out posts for several different social media networks. The thing is, you cannot schedule posts with a personal Google Plus profile. Buffer only supports Google plus pages. Since I am a huge fan of marketing automation, I believe it’s incredibly important to automate as much as possible. This benefit alone would cause me to create a Google Plus page for my blogger business rather than using my personal Google Plus account. Before we get to the steps on how to create a Google Plus page, let me address a common cause of confusion from recent Google+ changes. One thing that confuses people is the difference between Google Plus and Google my business. In short Google My Business is like Yelp, whereas Google Plus is like Facebook. One is meant for local business information and reviews while the other is meant for networking and sharing social media posts. The latter can be used as a local business and a website, blog or online business. The former is only meant for a local business with a local physical presence. To create a Google Plus page for your blog, website, or business, the first thing you need to do is sign into your Google (Gmail) account. If you don’t have a Gmail account, you will need to create one. Storefront: This is if you have a physical, commercial location, where people will come into your place of business. Service Area: If you run a service in a particular geographic location, this is what you want to choose. Brand: If you run a website, a blog, an online business, or sell items online, you should choose to create a Brand page. You want to choose a brand page for almost anything that doesn’t rely on local customers. Depending on your purpose you can choose a storefront, local service area, or a brand. For me, this Google Plus business page is going to be for a website so I will choose brand. Page name: This should be the name of your business, blog, or website. Website: Enter the URL for your blog. Type of Page: For the type of page, you can do product or brand, entertainment, community or other. If you have a website, you will typically choose Product or Brand. For those who are curious: If you are not aware, Amazon FBA is Amazon’s fulfillment program. It saves a lot of time when selling on Amazon because Amazon fulfills all your shipments and handles customer returns. FBA is so helpful for me in my Amazon business, so I decided to teach others how to make money on Amazon as well. Anyways, For my website, I will just choose product or brand since it will be a brand. Click I agree then create page. Before I created this Google Plus page for my blog, I had already previously linked this new blog to my Google Analytics account. I am using the same Gmail account for Google Analytics and my Google plus pages. So it automatically recognized my blog and displayed the analytics data right here on my Google Plus page. If you didn’t set up Google analytics beforehand, no worries, you could add your website to analytics later on. The Google Analytics data should start to show up on your Google Plus business page, once you add your site or blog to Google Analytics (under the same Gmail account). 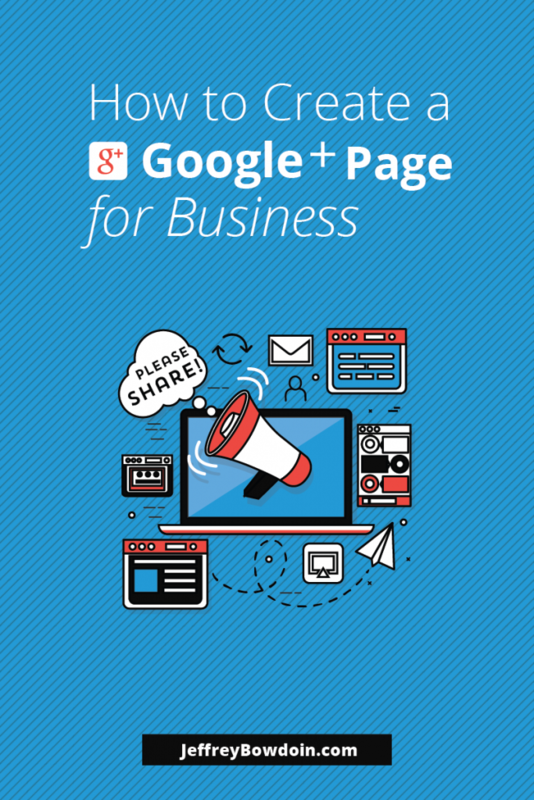 To begin using your Google Plus business page, you just click on Google+ in the upper left corner. You can now browse Google+ posts or add posts as your new Google Plus brand page. Just paste a URL, add an image, etc. If you want to change your Google Plus page, then you can also switch between your other accounts. For example, you could start using your primary personal Google plus page, or your other brand accounts just by clicking on the upper right corner where it shows your Account icon. That’s pretty much it for creating a Google Plus page for your blog and using your new Google Plus page. It’s pretty straight forward once you start using it! In a future post, I will also show you how to create a unique URL for your Google Plus business page. This will make it easier for people to find you. It will also allow you to have more brand recognition with a unique URL that represents your brand (or your website name). If you want to maximize your impact, you need to get yourself or your brand (website) out there. This includes creating a Google Plus page for your blog but most importantly using it. So if you haven’t done so, I would do this for every website or blog you have. If you get stuck anywhere leave a comment, and I will help you out! Also, let me know your thoughts on Google+ and if you agree that it is a good idea to use for marketing your blog or business!